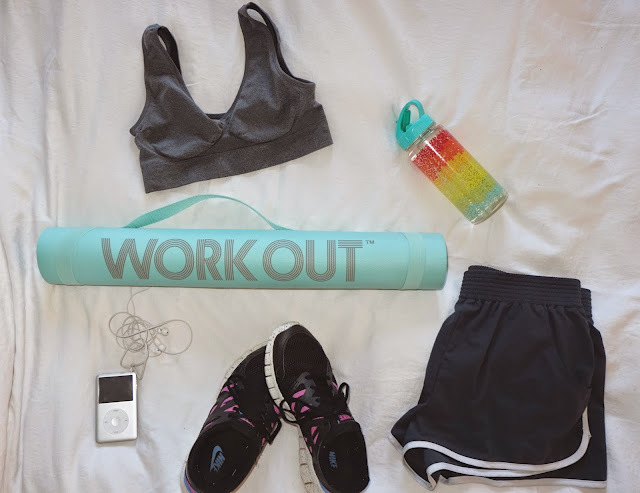 In the third instalment of 'The Everday Girl's Guide To Fitness' I want to talk about my 'Workout Essentials' and give a little update on how I'm doing in my bid to get fitter. Since my first post in this series, I've seen steady progress in my fitness. I try to work out five times a week, for up to an hour each time. When I first started I could barely run half a mile without feeling as if my lungs were going to collapse. But now, after just under three weeks, I can run 5 km without feeling like I might pass out. And I know that may not be a lot to some people but hey, everyone has to start somewhere. This is definitely my number one workout essential. If I don't have a sports bra on, I feel very uncomfortable and find that I don't push myself as hard as I usually would. I think it's important for all women, no matter what size chest you have, to wear a sports bra when working out to keep everything in place. I cannot stress enough how important drinking water is when you're working out and especially after you've finished a workout. As we workout, we sweat, so it's important to replish our bodies with the liquid we lost through sweating. I aim to drink about three litres of water a day and once you get into the habit, it becomes second nature to you. Wearing proper shoes when working out is another important workout essential. I've seen people wearing converse in the gym and just looking at them makes my feet ache! If you're doing any sort of running or walking, you need shoes that will support your feet. My Nike's are so comfy and light for running. It's definitely worth investing in a pair of good running shoes! Now this workout essential may not apply to some people, as I have friends who don't like listening to music when they workout. But for me personally, if I don't have a good workout playlist pumping in my ears, I find it really difficult to push myself and get a proper workout in. I find that wearing clothes that are only worn for working out such as running shorts/leggings, help me to get in the right mind set for working out. I've recently bought quite a few new pairs of leggings and a few new workout tops and jackets to motivate myself to keep going and it seems to be working! This last workout essential again may not apply to all of you, but I've recently discovered how much I love yoga, so a yoga mat is essential. I love yoga because when my muscles are sore and tired, it stretches them all out and leaves me feeling centered and relaxed. I picked up the one in the picture above from Penneys for just €6 and it comes with a handy strap to carry it. I hope you enjoyed today's post and I'd love to hear what your workout essentials are, let me know in the comments! Thanks so much for reading!